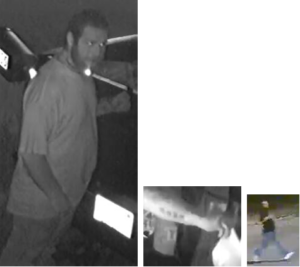 An unknown male was captured on home surveillance video walking up to the pickup truck parked in front of the victim’s residence and removing a generator. He fled on foot pulling the generator behind him. The suspect appears to be a white male, wearing a black shirt, jeans and white sneakers. There is a four letter tattoo along his right forearm and possibly multiple or a sleeve style tattoo on the left forearm. This incident occurred on February 22, 2019. The residence is located within the city limits of Lake Worth. ← The Palm Beach County Sheriff’s Office needs the public’s assistance identifying a vehicle burglary suspect.